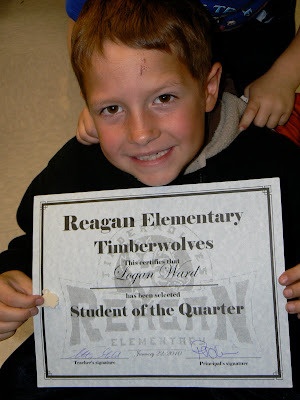 The Many Mini-Adventures of the Wards: Logan is Student of the Quarter! Logan works so hard in school. He tries his best every day and loves to please his teacher. All his hard work hasn't gone unnoticed. He was chosen by his teacher to be Student of the Quarter in his class. That good attitude doesn't exist only in the classroom. He is great at home too! He is always eager to get his homework done (that means more playtime, of course) and most of the time does his work without complaining. He is a great example to his siblings and encourages them to work quickly too. Logan got another award on this day too. It's hard to see, but look at what he's holding in his right hand. It's a small charm in the shape of a brain! He attended the Chess Club and all the members got this super cool/rare charm for being a part of it. So cool! We are so proud of you for trying your best every day at school. We love you and know you can achieve great things by working hard giving it your best shot. Way to go Logan!